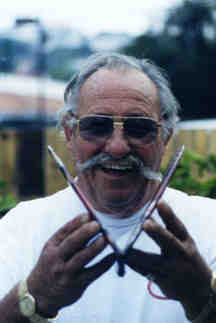 Dale Velzy invented the Velzy V-fin in 1951 to hold the tail of his board in hollow waves at El Porto and the shorebreak of Manhattan Beach. The fin was very successful in performance and was found to be an excellent noseriding fin as well. The exception was that making the fins of wood and even fiberglass in those days presented a number of problems. Something was always breaking, or the fins made from fiberglass were expensive to make and to glass on a board. In more recent years, the advent of modern fin boxes allowed Velzy to work with V-fins of fiberglass, plastic and nylon with good success and to offer the fins on limited basis to his friends and local surfers in Southern California and Hawaii. And, those who have tried them really like 'em. Recently, two very important changes have happened. The cost to produce the fins has come down and the strength of today's V-fin is remarkably increased. Skip Frye goes off about Velzy's V-fin. "Today I feel like I've got those problems solved by asking SurfTech to build these fins for me," said Velzy. They're strong and they work better than ever." "The V-fin makes a board turn right now. And the noseriding, it's absolute perfection! Down the line, the fin holds the tail into the wave and also keeps the tail from popping up while you're on the nose. They really work great." 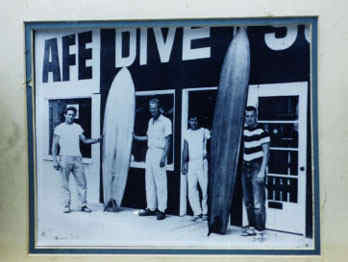 Velzy, left, with Hap Jacobs and an early V-fin surfboard. If you look at the Aussie yacht in the early 60's, that won the Americas Cup, you'll see the V-fin. And if you look at jet fighters today, they all use twin fins, with some "V" formation to them. They too want to turn "right now"! Most of tomorrow's spacecraft, still on the drawing boards, use some form of V-fin. The V-fin setup even goes up-wind better on a windsurfer. "The Hawk" was onto something way back. Which is one reason he never gave up. Don't make the mistake of missing this surfing sensation just because it's different. For arrogant stupidos, and missing out, see Historical Note in "Skip Frye Goes Off" link above. Surf the advanced techology and artistry of one of surfing's most famous legends. Get a Velzy V-fin today. Share it with your friends and blow their minds too. These high-quality, hi-technology fiberglass fins are $125 plus $6.95 shipping and handling within the U.S. and its territories. For international orders add $29.50 for shipping and handling.